There are a few reasons puffer jackets have been a longtime favorite among the fashion set, making numerous appearances fashion month after fashion month all over the world. First, they’re super comfy, secondly, they keep us warm on even the most frigid of days (my NYC colleagues can attest to this), and thirdly, they’re perfect for hiding that hideous bulky college sweater you’re secretly wearing underneath. On my hunt for one perfect puffer jacket for my upcoming travels, I stumbled upon a stylish slew of them from Andrew Marc and Marc New York—we’re talking everything from modern bombers to long dusters and everything in between. Sidenote: I also spotted a few non-puffer options that are so good they needed a little moment here too. (The suede moto? Um, yes.) Keep reading for all 11 of my favorite jacket picks. I’ll be sitting here patiently waiting for puffer-jacket weather. 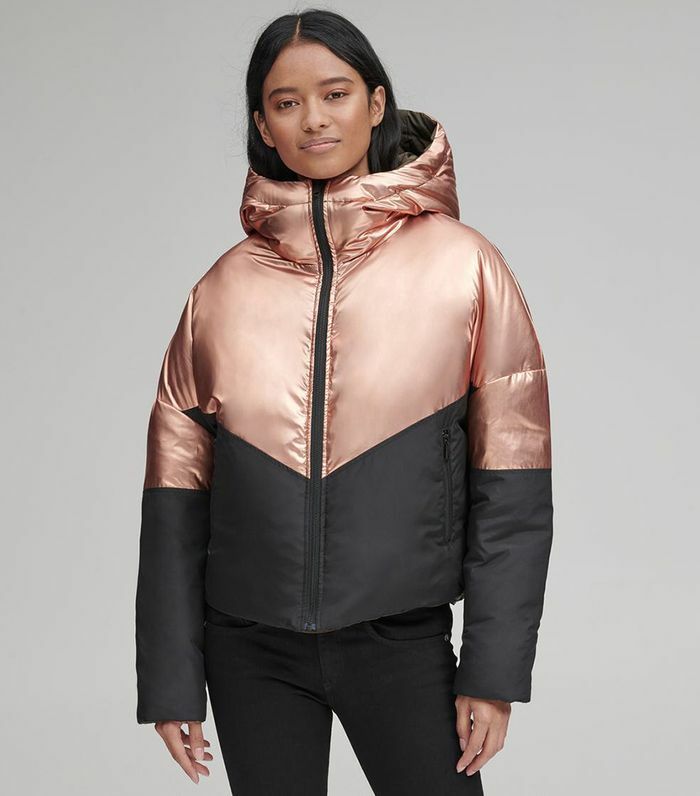 Who doesn’t suddenly need a reversible rose gold puffer jacket? This style is my #1 pick. Horizontal quilting with faux down in a vintage tone is a fashion-girl staple; just add an oversize turtleneck and relaxed-fit denim. If you haven’t heard, “stylish Upper East Side mom” is a look, and I’ve probably never liked a trend more. Plus, this collar is removable (we can never say no to versatility). Don’t ever limit yourself to one jewel tone. Mixed quilting on this faux down fill jacket makes this style ultra-elevated, with a slightly futuristic vibe. Leather pants encouraged. When big and bulky is the only coat that’s going to cut it, add chunky sneakers and a mini bag to stylishly play with proportions. This option is reversible, meaning you get two jackets for the price of one. Honestly, is there anything better than a dusty pink suede moto jacket? I’ll wait. This classic coat is very “timeless movie star from decades past walks in Central Park,” and it definitely demands a spot in your winter wardrobe. An anorak in olive green achieves the same utility-chic look when it’s not quite as chilly out. We’re experimenting with swapping out navy blue for deep pops of purple.